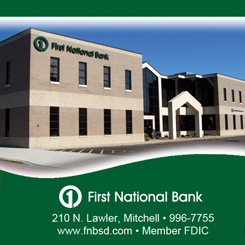 Monday -Friday 8:30 a.m. - 5:00 p.m.
First National Bank is proud to be part of the First National Nebraska, Inc. community of banks in Nebraska, Colorado, Kansas, Texas, Iowa and Illinois. We've been named to Forbes, America's Best Banks, list for 2015. As the fourth largest agribusiness lender in the nation, we proudly support South Dakota agriculture. With more than $19 billion in managed assets and over 5,000 employees across seven states, we're able to deliver sophisticated products and unmatched strength in lending while maintaining that personalized service from our local teams in Mitchell, Woonsocket, Huron and Yankton our customers have come to trust.